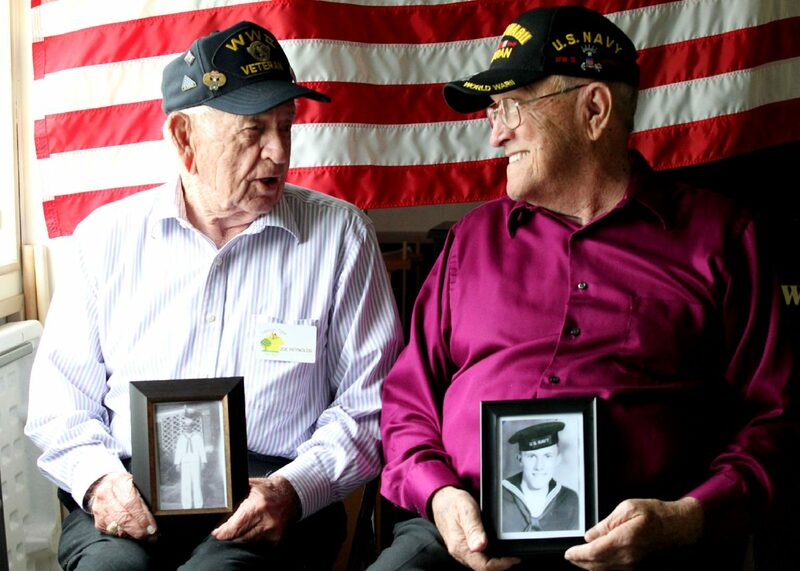 Joe Reynolds and Merle Mikkelson, both WWII veterans, hold photos of themselves when they served in their early 20s in the armed forces Friday Feb. 9, 2018, in Mission. 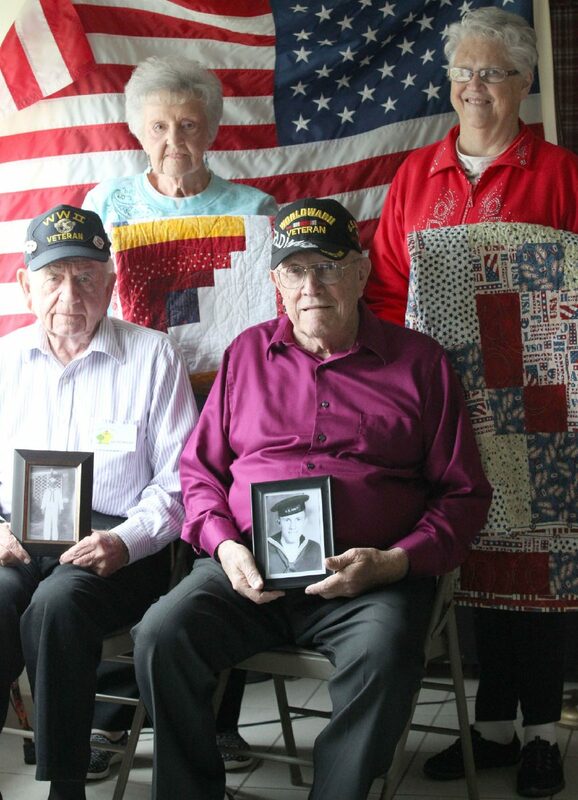 Reynolds and Mikkelson received Quilts of Valor for their service during a ceremony earlier in the week. MISSION — For a few months of the year, Joe Reynolds and Merle Mikkelson grace Lemon Tree RV Inn. The winter Texans and Iowa natives are two of the remaining 600,000 WWII veterans alive today. Along with their wives, they consider the Rio Grande Valley as a second home and the community of the park to be “one big family.” On Wednesday, Feb. 7, they received quite a surprise from their Lemon Tree neighbors. Reynolds, 95, and Mikkelson, 91, stepped into the recreational hall for ice cream and cake, only to realize the room wasn’t full for sweets. Les Peugh, RV manager, and Gwen Baker, quilter, gathered nearly 175 of the residents to honor the vets with Quilts of Valor. Joe Reynolds and Merle Mikkelson, both WWII veterans, along with their wives Francelia Reynolds and Bonnie Mikkelson, are seen Friday Feb. 9, 2018, with the Quilts of Valor they were awarded earlier in the week in Mission. Quilts of Valor began in 2003 and the group now has chapters in all 50 states. The purpose, said Baker, is to honor our veterans a quilt that may take between 15 to 20 hours to complete. The end product is a warm, cotton quilt roughly between 4 by 5 feet and 6 by 7 feet. Volunteers donate the materials and sew the patches of fabric together. There are currently 21 million helpers who have taken up the project. The quilts are awarded to veterans per request and are done by the nearest chapter. Today, just the state of Texas is behind on nearly 300 quilts. Due to Reynolds’ and Mikkelson’s distinctions, said Peugh, they were moved to the top of the list. Both grew up in farms in Iowa — in opposite plains — and enlisted into the Navy shortly after completing high school. Mikkelson, a second-generation vet whose dad fought during WWI, was active from 1944-46, followed by four years in the reserve, while Reynolds also served from 1944-46. It was not until both wintered in Texas, however, that the two met. Reynolds was deployed at the same time as four of his siblings. One of his more vivid memories was when his older brother got him out after three days and nights spent in the Bilibid Prison. He forgot his hat, which landed him in prison until his brother could take him one so he could return to his station. “I didn’t get to ride the plane back,” he confessed. Rather he sailed back past thousands of islands. What stuck out to Mikkelson was his return home when he beat the Western Union notification. After being discharged out of Illinois, he sent a telegram home telling his folks to meet him at the morning train. He used a hotel payphone to dial home. It was not until after his father made the trip to pick him up when, seated for dinner with his family, the Western Union made their call. “I beat Western Union home!” he exclaimed. The two stay active by participating in daily activities at the park, which include pancake suppers, bingo, crafts and making visits to the library. “All the nice people and pretty girls,” Reynolds added. Reynolds and his wife Francelia are proud parents, grandparents and great grandparents to two daughters, three grandsons and three granddaughters, respectively. They got engaged before he headed overseas. Mikkelson and his wife Bonnie have a combined six children, 10 grandchildren and 12 great grandchildren and have celebrated over 40 years of marriage. According to Peugh, 53 veterans call the park their home. The nearest Quilts of Valor organization to the Valley is based in San Antonio. Baker encourages anyone to reach out to her if interested in helping honor our veterans’ patriotism with a quilt. Baker can be reached at lemontree@nodelparks.com. For more information, visit qovf.org.